Hello everyone! 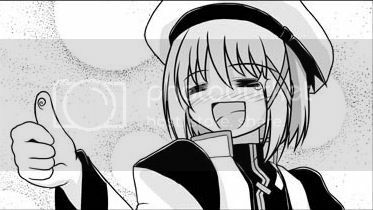 Today we're releasing A Piece of my Wish, another doujin made by Kohakura, one of our favorite Nanoha doujin artists. This is a 26 pages long doujin that takes place during the events at the end of Nanoha StrikerS. It's a emotional story about Nanoha, her doubts as a mother, and how much she needs Fate. Has been a while since we had some NanoFate doujin, I am glad, thank you guys! You have to love this one. And I mean it because at one moment Nanoha comments on how much Fate help her to hold back when she promise to her helping in the rescue of Vivio… but in the anime Nanoha and Fate were in two complete separate missions that weren’t even related. I guess is the intention what matters but still. Anyway, a nice heartwarming release as usual. Thank you guys, for this awesome doujin! Thank you, I love this doujin! As always you have my thanks for the release! I doubt the file is infected. If your Antivirus doesn't let you download from MediaFire and the other free uploaders, try using the NanoFate.us direct download link that I just updated (this link).